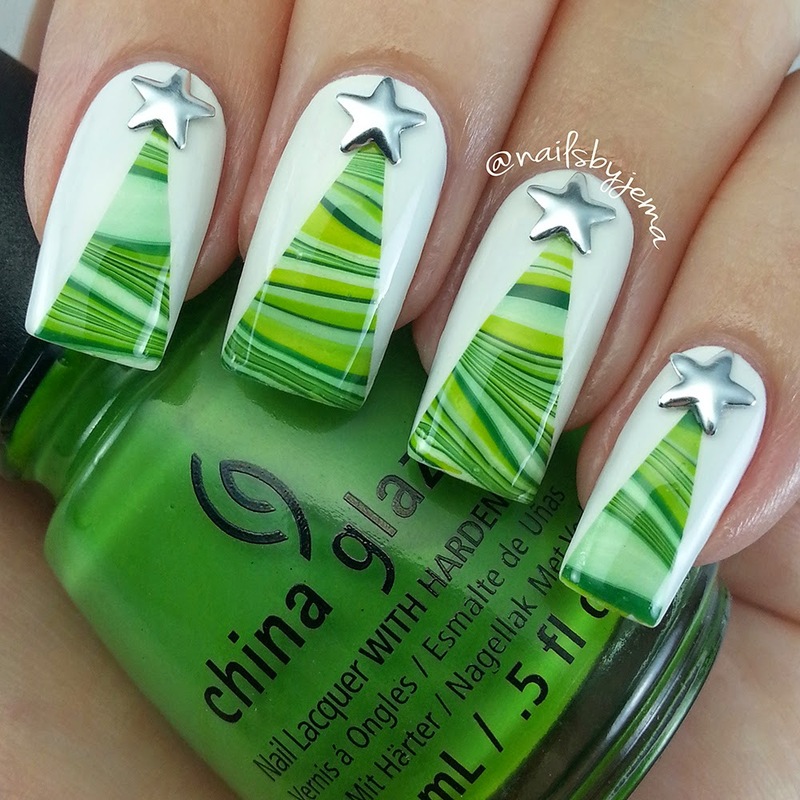 N A I L S B Y J E M A: Watermarble Christmas Trees!!! Oh... And video tutorials! So... I kinda stole a mani idea from my girl @banicured_ on Instagram! But it's just so gorgeous I had to copy it. The problem is, I can't watermarble at ALL so I did what @yagala does, and left the design on the water to dry overnight, and then removed it in one piece and cut it up for decals! It's so much easier & less stressful that way!! The scraps! 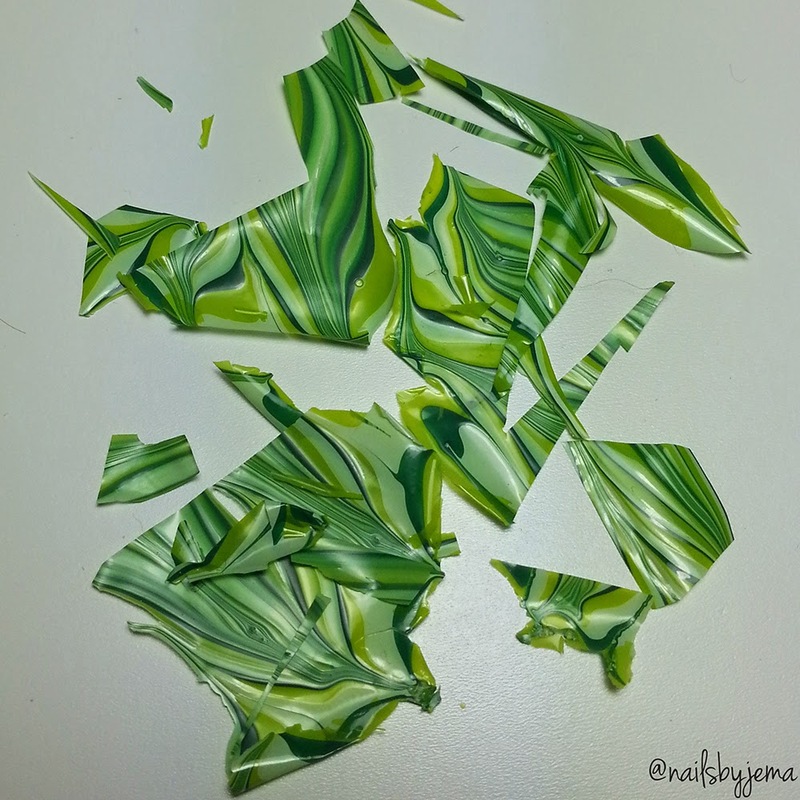 It's a watermarble crime scene! Polishes used were a base of OPI 'Alpine Snow' & the trees are China Glaze 'Gaga For Green', 'Def Defying' & 'Re-Fresh Mint' in a watermarble. The stars are studs from eBay. I left the watermarble design in overnight as that is what I read was best but I've since been told that an hour is long enough. Trial it for yourself but remember the temperature of the room it's in will affect drying time and if you do try and take it out too soon it will break. After I removed the design, I simply cut out the part of the watermarble I wanted into a triangle, checked it would fit on my nail and not be too wide then applied a quick thin coat of polish and using tweezers, applied the watermarble piece to my nail. Press it down and using a soft/high grit file, lightly file off any extra from the end of your nail. Apply a top coat and glue the star on! The video is in two parts since I haven't uploaded this one onto YouTube yet. Oh how I love this mani!